Just in case you get lost. The smaller stages were packed with fresh faces that had arrived that morning. Crowds turned out in their finest fancy dress. These 'monkeys' had their own team song. Cults were not put off by an early slot in the Festival Republic stage. 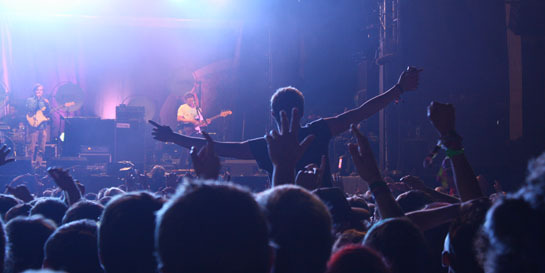 Island's Bombay Bicycle Club were one of the day's most anticipated bands. The NME/Radio1 stage was full long before the band took to the stage. Fiction's Crystal Castles kept the crowd at the NME/Radio1 stage. Alice Glass got up close with the fans. Fixers play the BBC Introducing stage, the festival's smallest stage. ...and bought their confetti cannons along too. The Strokes bring the main stage to a close. There's only one day left. If you see us around tomorrow make sure to come say hi!